The drum roll builds as David Letterman playfully introduces the top ten list winner of “Pieces of advice I gave my celebrity child,” and I slide onto the stage. 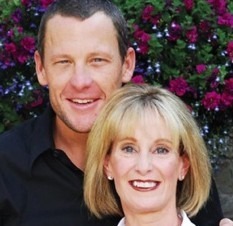 “Say hello to Lance Armstrong’s mother Linda!” wows Letterman. Looking out into a sea of faces, I deliver my lines. “That whole Tour de France win five in a row thing? My idea!” The audience howls. That appearance on the Late Show still makes me laugh. And other interviews with Dr. Phil, CNN, ESPN, and the personal visit with Oprah at her home, although surreal at the time, are a wonderful reminder of how unpredictable life can be. I grew up in the Dallas projects in a family with three kids, an overwhelmed mom and alcoholic dad. One of the few early memories I have of my father is physically abusing my mother while my siblings and I huddled in the closet. Being raised in an environment without a lot of guidance can leave emotional gaps, and for me, created a desperate need for attention. At 17, I became pregnant and gave birth to my son Lance. Lance’s father was an abusive man, and after enduring two years of repeated violent episodes, I walked out. Lance and I were on our own. Ironically, it was during that same time that I reunited with my father and discovered the power of forgiveness. After abandoning our family and spending years lost in alcohol, he found sobriety and was eager to make amends. It was a valuable first step for me and him to begin to let go of the pain and hurt. Later in life, I would come to realize the importance of letting go and freeing the spirit within. In those early days we barely got by, but I found that hard work and a fierce determination to not give up, kept food on the table and a roof over our heads. One job after another, I gained basic skills and with the help of a strong center of faith, I never lost hope. I learned to be my own best friend and advocate, with the unfailing sense there was a prize waiting for me at the end of the line. Lance and I developed a special bond that allowed us to grow up together. I was the mom who’d take him and his friends to Van Halen, roller skating, sports events and encouraged him to be his very best at whatever he chose to do. It was exciting to watch him take on challenges and see his athletic talent and spirit grow. He seemed to have a core of pure energy that threw off sparks. As a young mom I overcompensated for what I needed but didn’t get as a child. So our vocabulary was filled with nothing but positives. The 1980s hadn’t quite caught up to the idea of working single moms, especially those without an education. But I was a fighter. I taught Lance early on that mistakes were opportunities to learn from. I poured my energy into two things: being the best mom I could, and figuring out how to climb up from an entry level office job – the lowest rung of the corporate ladder. As a young female with no experience and only a GED competing with university grads who took their futures for granted, meant that I had to dig deeper, work harder, and lean on raw street-smart talents of common sense, an attitude of fearlessness, and the desire to get ahead. It worked. I went from temp clerk to global account manager with an executive corner office, making more money than I could ever have imagined. I loved my job and became obsessed with work until the day a colleague shocked me by saying I was getting too thin and didn’t have balance in my life. Thanks to her, I spent time with a therapist who was the first person in the world to say to me, “You don’t like yourself.” She was right. When forced to look at myself, I realized I wasn’t happy. I was hiding in the business of work. This realization helped me to explore and find ways to take better care of myself. After that I made time for me and everything changed; the way I felt and my whole outlook on life. Self-love is a powerful thing. When Lance was diagnosed with testicular cancer at 25, the prognosis was grim. Cancer shakes your whole world and you become frozen in time. Before his illness, I’d jokingly call myself a barracuda, but during his chemo, I became even more so. I was a fearless mom who didn’t hesitate to ask his medical team questions or express how I felt. I grew stronger. The first thing I said to Lance when I received the news was, “This thing isn’t going to get us!” Attitude is everything. There is so much more information now about cancer and we survivors can all work to make things better. The Lance Armstrong Foundation raised millions of dollars for research and increased awareness. It is a foundation of hope. Life can feel like a huge roller coaster of surprises, joys, pain, and challenges. In my memoir, No Mountain High Enough: Raising Lance, Raising Me, I share my journey as a struggling teenage mother who overcame insurmountable odds and found success. My definition of success isn’t measured by the car you drive, your level of education, how “busy” you are, or the size of your bank account. It’s the difference you make in the lives of others. Raising Lance was the most important work I could do. I raised a human being who is caring and sensitive to the needs of others. That’s success! Beyond his athletic achievements, he’s a good dad and a man who has personally reached out to thousands of fellow cancer survivors. Now, as a motivational speaker, I have a simple but powerful statement to give my audiences, “Never give up!” It summarizes how I’ve lived my life. I’m a risk-taker. It takes huge courage, drive and energy to live an inspired life, but we’re all capable of getting there. It’s a message I know with absolute certainty can help and motivate others to be more confident to make the changes they need to in their own lives. There are three things that make me proud. Number one – I make a seafood gumbo so mean it’s good enough to burn down your house. Number two – I carved out a career in the technology sector without a college education, or a hand-up from anyone. But what counts the most is that I played a part in another human being’s life that made a difference. That’s the true bar of success.